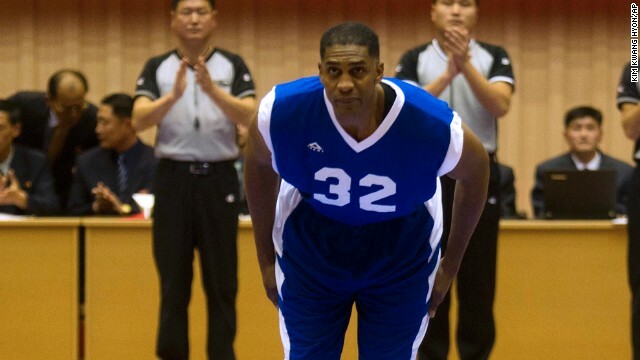 Ex-NBA Player Charles Smith to CNN: We absolutely did not get paid by North Korea. In an exclusive live interview from Beijing, ex-NBA player Charles Smith talked with CNN’s New Day Weekend anchors Victor Blackwell (@VictorCNN) and Christi Paul (@Christi_Paul) about the controversial “basketball diplomacy” trip to North Korea he took with Dennis Rodman and other former NBA players. CHARLES SMITH, FORMER NBA PLAYER: Well, I think everyone knows that the trip was based on sport. We’ve used the term diplomacy but this trip and the things that we do are a lot more than that. It’s more about cross cultural ambassadors. You know, we go out and we get engaged with other cultures. We get engaged from the standpoint of really getting into their customs and their beliefs for the purpose of understanding from a compassion standpoint and being able to represent them. And we’ve been doing this all over the world. So, my relationship with Dennis and the things that we’ve been doing have been just phenomenal. I think this trip had — because this is Dennis’ first time doing an event on his own — there was a lot of pressure added to him, the extent of the event and, you know, the things that transpired were, from my experience with him, were very unlike Dennis. CHRISTI PAUL, CNN ANCHOR: Unlike him in what way? SMITH: Well, you know, he’s been engaging. We saw what happened on the show. It was unlike him from my experience in dealing with him over the years. He definitely felt a lot of pressure. You know, what people do not understand about him, he’s had his Hall of Fame speech which stated that he’s a terrible dad, he said that publicly several times and, you know, what Dennis wants is he wants to — he has a deep desire to do something good in a big way for his family, his kids, and so his kids can be proud of him. And I felt — I felt for him. I felt for him on this trip because I saw the pressure mount. I saw him change and it was very difficult keeping him and everyone together. PAUL: So, I’m just wondering, how was this trip presented to you and who asked you to go? Did Dennis ask you to go? Did — who asked you to go and what did they tell you about your duties beforehand? SMITH: Well, this was an amazing trip and how it came together was pretty amazing. But my involvement in it was a phone call from Dennis. It was a phone call from a friend that needed some assistance and, you know, he mentioned what he wanted to do and where he wanted to go. And, you know, I went to my advisors and my wife, Lisa, is probably my biggest advisor. And initially she said, no, I don’t think that’s a good idea. But I went through a lot of my advisors and we talked about it, and we had some concerns, but when it came down to it, as I mentioned at the start of the show, we’re cross-cultural ambassadors and this was going to be a great event from the beginning to the end — and it was. I had no regrets in making the decision from the time I start to the time I left. There will be some great outcomes coming from it, very positive outcomes. And Dennis needed the assistance, so I helped him with getting the players and helped him with the — some of the execution and took a lot of the pressure off of him. BLACKWELL: OK, Charles, you talk about getting a call from a friend who needs some assistance. Let’s talk about someone else who needs some assistance, Kenneth Bae, who’s being held in North Korea. He’s been held since 2012. Real explanation from the government of what he did wrong. There are reports that Kim Jong-un recently ordered the execution of his uncle as well. Were you aware of the case of Kenneth Bae, the execution of Kim Jong-un’s uncle before you decided to go and help your friend and play basketball in North Korea? SMITH: Oh, absolutely. I think, you know, the reports were widespread throughout the U.S. definitely knew some of the things that transpired in the media involving North Korea. But that’s not we were not going there for that. We’ve been to some other places around the world that were controversial as well — not as controversial as this, no doubt. But we didn’t go there for that. We went there to do what we normally do, and that’s to be cross-cultural ambassadors and use the game of basketball as a bridge for exchange — and we did that. BLACKWELL: I’ve just been given the wrap-up. We’ve had it, believe it or not, a 30-minute conversation and we really appreciate your candor and being open and speaking with us. I’ve got one more question that I think we glazed over and it was about the compensation. I don’t mean to belabor the point, but quite bluntly, was there any compensation — any money that came to you from the North Korean government? SMITH: Absolutely not. I think I’m astute enough to understand the dynamics, especially collecting monetary dollars from North Korea. No, we did not get paid from North Korea at all.